It is human to overgeneralize based on the chance co-occurrence of rare events. As a scientist, I know this. I spend a good deal of my research time sorting through quantitative patterns in data, fending off the tendency to infer a meaningful biological pattern where only chance trends are present. And yet, the events at Alva Lake last night shocked me. The Toussaints, dear friends who live on the lake and kept me alive during my first year of loon research in 1993, had informed me before my team attempted capture of the breeding pair and their month-old chick that the male had been holding his leg strangely, as if injured. My crew had reported no abnormal behavior of the pair; indeed, I had seen only normal territorial and parental behavior when I had scouted the lake for capture at noon. Still, the Toussaints are careful observers of loons, so their statement gave me concern. I told them as we cast off from the dock that we would try harder than usual to catch the male, just in case. Capture was swift and uneventful. Both pair members sat protectively on the lake’s surface as we approached slowly and scooped them into our net. After catching the chick as well, we headed back to the dock feeling good about ourselves. Not until we inspected the female’s legs on shore did we detect anything amiss. As the photo shows, the female’s left leg was encircled tightly just above the foot by Dacron fishing line (used commonly in Wisconsin for muskie fishing), and a 5cm-long thick snarl dragged behind. The line had become tight enough to bite into the leg and cause a painful wound. Taking great care not to worsen the wound, we cut through the super-strong line and removed it. Fortunately, the entanglement appears to be recent, the wound superficial. The female should recover fully within a week. Surrounded by three generations of Toussaints and still jittery from seeing the female’s leg, we were ill-prepared for the sight of another, more severe injury on the male. 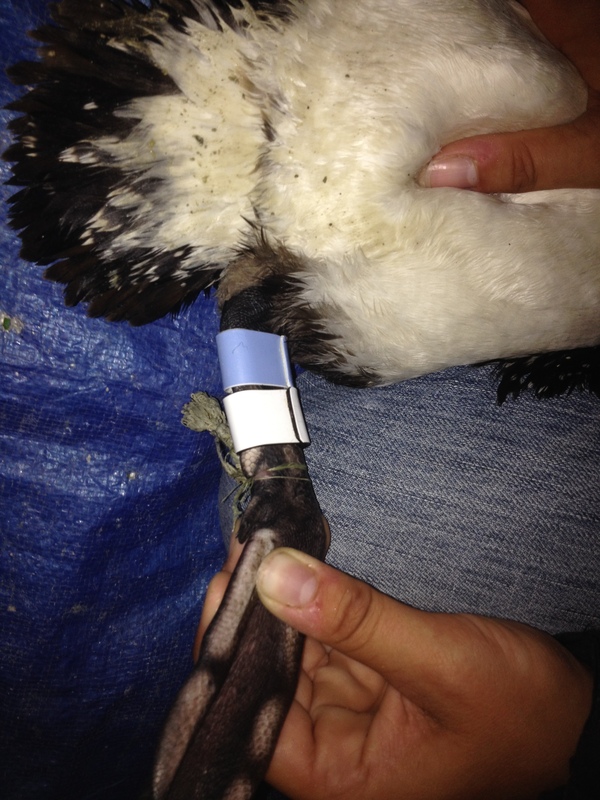 In this case, monofilament line had become wrapped around the leg just below the ankle joint. Again the line was constricted tightly around the leg, but this entanglement had occurred many months ago and the skin and keratinized scales of the loon’s legs had overgrown and surrounded the monofilament strands, leaving the circle of line protruding to the outside via two holes in the skin, like an earring. Though absorbed and surrounded by leg tissue, the line had caused local inflammation, as revealed by the irregular swelling in the adjacent portion of the leg. After an emergency consult with Mark Naniot of Wild Instincts, we resolved to pull out the line if we could do so without doing further harm to the bird. Fortunately, once cut, the line slid easily out of the holes, revealing infection but an injury from which the bird should recover. Shaken as I am by seeing back to back angling-related wounds, I chalk up the discovery of two such similar injuries within a mated pair mostly to chance. That is, there is no reason to suppose a sudden, devastating impact of fishing line on the health of common loons. After all, we have captured dozens of other loons this summer that showed no ill effects from having lived in waters plied constantly by all manner of fishing lines, lures, baits, bobbers, and sinkers and riddled with tangles of line left behind by grouchy anglers. All but a few loons we have seen have thrived for many years in Wisconsin waters, despite this piscatory onslaught. So what can we learn from the events of last night on Alva Lake? Two lessons, I think. First, loons are tough. Designed for maximum strength and minimum thickness, fishing lines bite deeply into animal tissue when forced against it. The Alva pair, no doubt, experienced severe discomfort and some loss of circulation. Yet they completed two months of incubation, chick-rearing, and territorial defense and stand to survive their brushes with fishing line without permanent damage. Second, angling exacts a steady toll on loons and other wildlife. Loon populations are stable or perhaps even increasing slightly in northern Wisconsin. It is becoming obvious, though, that sustaining loon populations in areas where anglers are more abundant every year will require concerted efforts of those who love loons.